Park & Sun Sports portable outdoor volleyball net systems include everything needed for a fun and competitive playing experience. Offering exceptional performance for outdoor tournaments, friendly gatherings at the park, beach or even your own backyard lawn. Park & Sun Sports volleyball net systems are designed with premium quality materials that are built to last and keep your game going strong! Our poles allow you to set-up and easily adjust the net to official men's (8'), women's (7' 4") and co-ed (7' 8") volleyball playing heights. The Park & Sun Sports official size volleyball nets are regulation size, 3'x32', challenging you to cover the court like a pro. Our volleyball nets are crafted from a high-quality nylon blend with reinforced net tape bindings. Our nylon blend netting is superior at withstanding harsh weather compared to lower-end polyethylene (PE) nets, so you can enjoy the game for years to come. Each volleyball net system comes equipped with durable rope guylines that are going to keep the net taut throughout your action and play, and for added stability, our sets are anchored with forged steel ground stakes. So define your court with the included pre-measured volleyball boundaries, and when you are finished with your game, our net systems, come complete with a heavy-duty zippered equipment bag with carrying handles; making transporting and storing extremely convenient. Are you up for the challenge? Park & Sun Net Systems are! The Spectrum Volleyball Series was developed with tournament directors and enthusiasts in mind with its list of high quality materials, quick set-up, and proficiency to endure professional game-play, which is why it has been the number 1 choice among volleyball tournament directors and volleyball enthusiasts alike, for grass volleyball and beach volleyball for over 30 years. Advance your volleyball game with the Semi-Permanent 4000 professional volleyball net system. Tournament Level Portable Outdoor Volleyball Sets offer an exceeding level of play with their mix of affordability, quality and durability. Features "Aircraft-Aluminum" poles, paired with our exclusive Momentum Volleyball Nets. 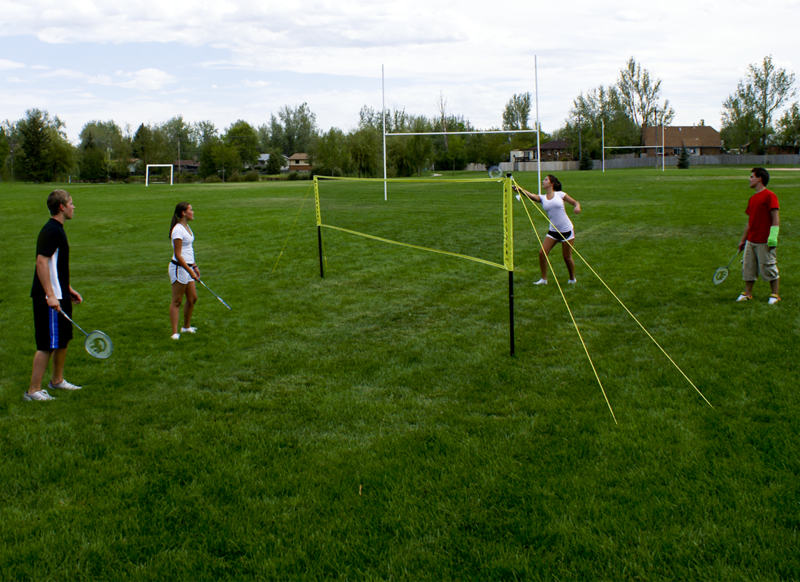 Sport Level Outdoor Volleyball Net Systems were designed with families in mind. Truly portable, lightweight volleyball systems that will last as you create memories and remind your family and friends, who the king or queen of the net is! Make a splash with a Pool Volleyball set; it’s perfect for those summer battles in the pool. 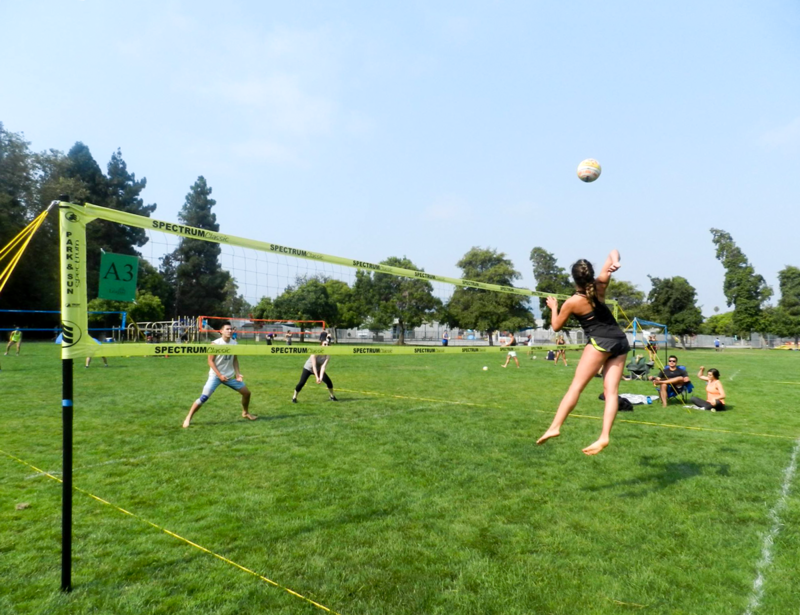 Park and Sun Sports has a replacement volleyball net for you, or upgrade your Park and Sun Sports' Outdoor Volleyball net system, and take it to the beach, with our official volleyball court size webbing boundaries and sand adapter kits! Tired of chasing volleyballs? Check out the Park and Sun Sports’ Sports Fence! Sharpen your skills with the Spectrum Volleyball Precision Trainer the best Volleyball training aid for bumping, passing, setting, spiking and more. The Park & Sun Sports portable outdoor badminton net systems includes everything needed for a fun and competitive playing experience. Offering exceptional performance from outdoor tournaments to friendly gatherings at the park or in the backyard. Our badminton net systems are designed with premium 3-piece poles that feature a push-button locking system, allowing for quick and easy setup, with a durable regulation size badminton net, which measures 21' L x 30" H. The net is made out of a durable nylon blend with a 1" top and bottom tapes with reinforced corners, and is equipped with convenient side sleeves, which distributes the net tension evenly from the top to the bottom of the net. The nylon blend netting is superior at withstanding harsh weather compared to lower-end polyethylene (PE) nets, so you can enjoy the game for years to come. Each set equipped with a durable double guyline with tension rings allow for quick adjustments that ensure the net remains taut, even during rough play. For added stability, (4) 10" zinc-plated forged steel ground stakes are also included. The badminton net systems come equipped with 4 aluminum badminton rackets and 3 A-grade nylon shuttlecocks with cork tips, letting you get outside and playing without delay. This entire set fits inside a heavy-duty polyester zippered equipment bag with carrying handles; making transporting and storing extremely convenient. The Park & Sun Sports portable tennis net set allows you to conveniently have a tennis match in the driveway or any flat area. This tennis net measures 15' long and 32" high, making it suitable for practice or a friendly game. Constructed with a tubular steel crossbar frame finished in classic black and 1 inch in diameter uprights and 36 inch wide end bases deliver additional playing stability. The set is complete with 2 high quality wooden paddles, to serve up your choice of a foam tennis ball or plastic pickleball, and a convenient carry bag for the whole setup.